Memories of Church No 1. Some of my earliest memories centre on Church. In our small migrant community in Ocean Grove during the mid 1950s, our kitchen was the biggest room. So every Sunday the Reformed people would meet at our home. Sometimes a sermon was read and on occasions a visiting preacher would do the honours. My dad played an asthmatic reed organ that he had rescued from somewhere – possibly the tip. He also loved the once a month communion service because the bottle of left over wine was passed on to him – a real treat at a cashed strapped time! I imagine his only regret was that cigars were not part of the service! 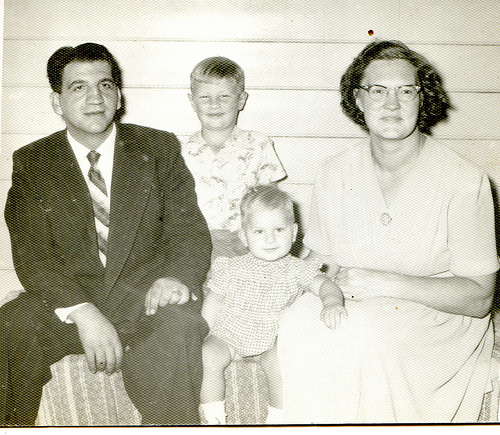 Our family in that kitchen in about 1957. N.B. I was a blond in those days. When the community grew in size we moved to the “Methodist Camp” which had a hall large enough to accommodate the growing community. My brother was baptised there as a baby in 1956. Later it was the Anglican Church Hall. A time came when we built our own church building over the road from the Primary School. A disused army hut was moved on site and as funds became available it was rebuilt to serve as a multi use hall. The kids were able to help by carrying and painting and serving cups of tea and coffee. However by the mid 1960s most of the dutch migrants had moved closer to Geelong and to places of work. The church closed and the building was relocated to another town for another small congregation. This period of time, at the most encompassing 12 years, has warm memories for me. The overwhelming sense is one of community and cooperation. “New Australians” needed each other as they coped with the massive issues of arriving in a new land. For a while we shared a car with one of the other families. People helped each other out and the church building was just a small example of a bigger attitude of selfless service. When babies were born the rest of the children were farmed out – this was so “usual” for us and it was fun to have new brothers and sisters for a week. This was my first memory of church. It was what I thought church was about. Years later as wealth entered the community and people became more independent something was lost. But I like to dream. I remember the time when people walked from all corners of Ocean Grove just to come to our kitchen. I remember the laughter as the adults drank coffee and smoked (sorry – I have to tell the truth!) after the service. There were all these friends I could play with and we could take walks near the marshes along the river. That was Sunday and that was church. When I got back home and everyone had left I would find dad settling down with a glass of wine, and a cigar – if he was lucky. They were great times. I want to write a book about some of these thoughts. I just need to get my head around how to organise it. Thanks Pieter for these memories which trigger some for me too. In some significant ways those times were like those of the early Christian church as described in the last lines of Acts 2: people very much needed each other and God – who was very real for many as a result. People could also see God in many of the changes happening before their eyes. Thanks Fred, I love that comparison to Acts 2. I think those years were the closest I’ve ever been to that community. Then maybe it is just the fog of naive childhood. Thanks Henriet, it was an amazing time. Dad’s name was Maarten and he passed away in 1994. He was a man of God but would not always let the Church Council get its way without his opinion. I know in later years when he became an elder (joining the enemy camp so to speak!) he was greatly appreciated by those he visited.